HELP BUILD A CHRISTMAS STABLE FOR ATHENA, AN ABUSED HORSE. This beautiful horse we call Athena, has known nothing, but misery and abuse all her life. Used for the “beach rides industry” Athena was a "money making machine". She had a baby foal last year , who then died after it was attacked by humans. Athena went into a depression and could not be “ridden” any longer . She was of “no use” to her owners. Fortunately we rescued Athena , who is now at our Shelter getting lots of Love and medication. 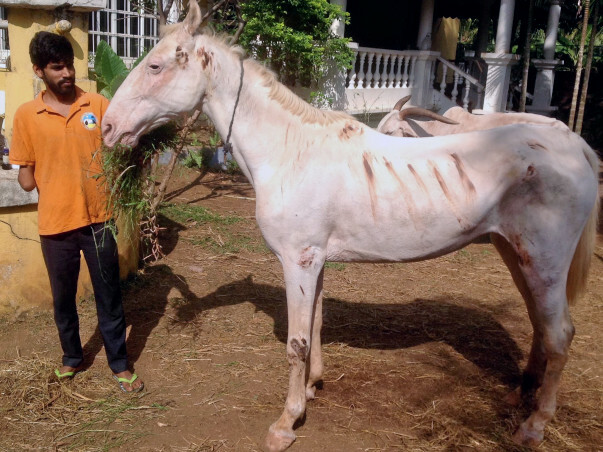 She is severely malnourished and is almost blind, due to a poor diet and abuse. However, we need to build a Stable for Athena, so she can feel safe and warm. She is also on medication and requires supplements and a varied diet. You can help Athena by donating , so that she has a long and happy life, never having to be used for the cruel horse riding trade. Athena is now fully recovered and is an elegant old lady. She will never be ridden again. Athena is doing really well and is now fully recovered. She spends her days relaxing with her friend. Athena will never be ridden again and will lead a happy and free life. Thank You for helping this beautiful Horse. Thank you for the support. Our dear Athena is doing very well, and now enjoys the company of other Horses too. She still loves the Cow Calfs too!. She has put on lots of weight too.